This White Paper results from the collaboration of Design for All (DfA) and e-Accessibility expert bodies representing the European Union member states [ref: the coordination centres of the national European Design for All e-Accessibility network (EDeAN) in 23 European Union Member States, in this document referred to as NCCs]. The objectives of this White Paper are threefold: (1) to present the current state of affairs of EDeAN, active since 2002 as part of the European Commission’s action line supporting the development of the European Information Society; (2) to outline a roadmap for future initiatives, actively reflecting views of the EDeAN network in specific domains related to DfA, e-Accessibility and e-Inclusion; and (3) to bring forward a set of suggestions and recommendations regarding the activities of the network, aiming to support the creation of a fully inclusive European Information Society. 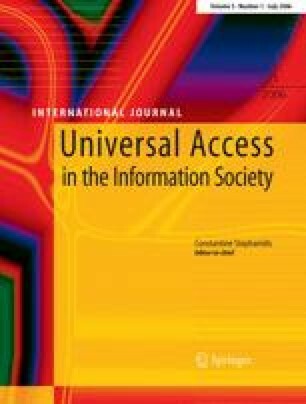 The paper is organised as follows: Section 1 provides a short introduction to DfA and Accessibility in Information Society (IS) and Information Society Technology (IST) developments in Europe. Section 2 provides an overview of policy as well as R&D activities related to DfA and accessibility in IST in Europe. Section 3 briefly describes the role of EDeAN and the new challenges that emerge as a result of the changing European policy environment. Section 4 presents current challenges that emerge in five domains directly related to DfA and accessibility, such as policy and legislation, industry, monitoring and evaluation—benchmarking, standardisation, R&D, and education and training. Finally, Sect. 5 puts forward a number of recommendations with regard to future activities for EDeAN. The contents of this paper reflect results from the open discussion forums supported in the EDeAN website (ref: EDeAN Special Interest Groups, SIGs). The draft paper was written by the EDeAN Secretariat for 2005, FORTH-ICS (Greece), and completed with the support of all NCCs. Support was also provided by the European Commission DG Information Society and Media and by the D4ALLnet project (ref: an EC funded project with the code IST-2001-38833). The White Paper has been edited by I. Klironomos, M. Antona, I. Basdekis, and C. Stephanidis. The EDeAN Secretariat would like to thank the European Commission for their support, and the D4ALLnet consortium, for providing the online networking infrastructure for EDeAN and for mobilising the network members. We would also like to thank Paivi Tahkokallio and Pier Luigi Emiliani for their particular efforts and contribution to this paper. D4ALLnet IST-2001-38833 (Design for All Network of Excellence) is a Thematic Network funded by the European Commission (1/1/2003–31/12/2005). The project partners are: Foundation for Research and Technology-Hellas (FORTH), Greece (Coordinator); National Research Council (CNR), Italy; The Danish Centre (DC), Denmark; Forschungsinstitut Technologie-Behindertenhilfe (FTB), Germany; Institute for Rehabilitation Research (iRv), the Netherlands; National Research and Development Centre for Welfare and Health (STAKES), Finland; Center for User Oriented IT Design, Royal Institute of Technology (CID-KTH), Sweden. The project members are: University of Linz - “Integrated Studies” (UoL), Austria; VZW Toegankelijkheidsbureau (VZW-T), Belgium; Institut de Recherche en Informatique de Toulouse (IRIT), France; Central Remedial Clinic (CRC), Ireland; The National Secretariat for the Rehabilitation and Integration of People with Disabilities (SNRIPD), Portugal; The National Centre for Personal Autonomy and Technical Aids (CEAPAT), Spain; Middlesex University—Collaborative International Research Centre for Universal Access (CIRCUA), UK; Fraunhofer—FIT (FhG-FIT) (together with FTB, forming the Design für Alle—Deutschland), Germany; Swedish Handicap Institute (SHI), Sweden; The Delta Centre, Norway. The partners and the members of D4ALLnet are also EDeAN NCCs as of December 2005.